Spc. Dennis Poulin was 26. The war in Afghanistan has taken the life of a 26-year-old member of the Massachusetts National Guard who died of injuries he s uffered during a “nonhostile incident,’’ according to the Massachusetts National Guard. Specialist Dennis C. Poulin of Cumberland, R.I., died Thursday, three days after the military vehicle he was riding in rolled over in Tsowkey District in Konar Province, the Guard said. He was taken to Landstuhl Regional Medical Center in Germany, where he died. “The Massachusetts National Guard is a close-knit family, and the loss of this soldier and any soldier is felt by all its members,’’ said Major Lisa Ahaesy, spokeswoman for the Guard. The military is investigating the incident that caused his death and did not provide additional details about it. Poulin, a gunner in the service, was deployed in July to Afghanistan along with 670 members of the First Battalion, 181st Infantry Regiment, based in Worcester. He was the 15th Massachusetts National Guardsman to have died while serving in Afghanistan, where more than 1,400 US service members have been killed in action since the war began, according to the US Department of Defense. According to the department’s website, 246 service members have died in nonhostile incidents. Of the Massachusetts service members who have lost their lives in Afghanistan, Army Specialist Scott Anthony Andrews, 21, of Fall River, was killed last June by an improvised explosive device. Andrews, who worked with heavy construction equipment, was the second service member from Fall River to be killed in Afghanistan in just over two months. Sergeant Robert J. Barrett of the Army National Guard was killed by a suicide bomber in April last year. 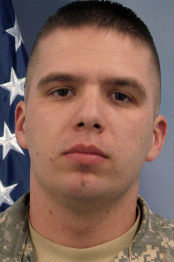 Joseph C. Carter, the Massachusetts Guard’s adjutant general, said the Guard mourns the “tragic loss’’ of Poulin.